For the third year in a row, visual artist and medical doctor Monika Auch will be running her annual Stitch Your Brain competition, and we’re very eager to announce that we’ll once again be sponsoring this exciting project. Here we’ll be showcasing the work of previous winners, as well as revealing which books the victorious participants will receive this year. 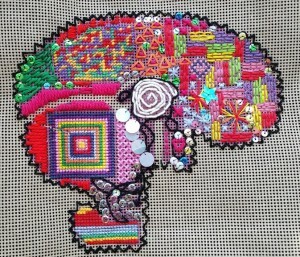 For those who don’t already know, the Stitch Your Brain project is a unique one. Open to everyone, this study encourages participants to create a handmade reflection of their own brain, using whatever techniques, colours and fabrics suit them. 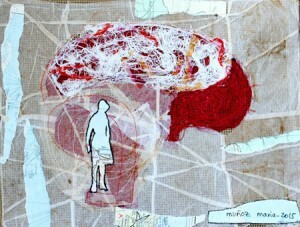 To enter, simply order a kit, stitch it and email a photo or scan of your finished brain. Past winners include Maria Munoz from Spain, who last year won a copy of Stitching Pictures: Combining Print and Mixed Media with Stitch and £50 to spend on the Bloomsbury website. 2014’s 1st place winner was Elise van Melis from The Netherlands who also received £50 to spend on the Bloomsbury website and a copy of Hand Stitch: Perspectives. 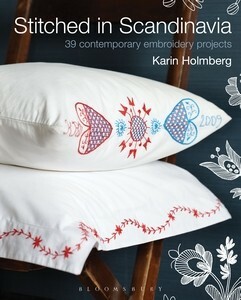 This year, 2016 entrants have the chance to win a copy of Stitched in Scandanavia: 39 Contemporary Embroidery Projects, as well as £50 to spend on the Bloomsbury website. 2nd place will also receive a copy of this book. Entries close at the end of April and the winner will be announced in May. As with previous years, Monika is also currently planning to host an exhibition of the brains in 2017. 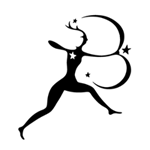 So, it’s time to order a kit and get stitching!